Vik is right along Iceland's famous Ring Road, and is the country's southernmost village and faces the Atlantic Ocean. Less than 300 people live in Vik yet it's the biggest settlement for 70km. 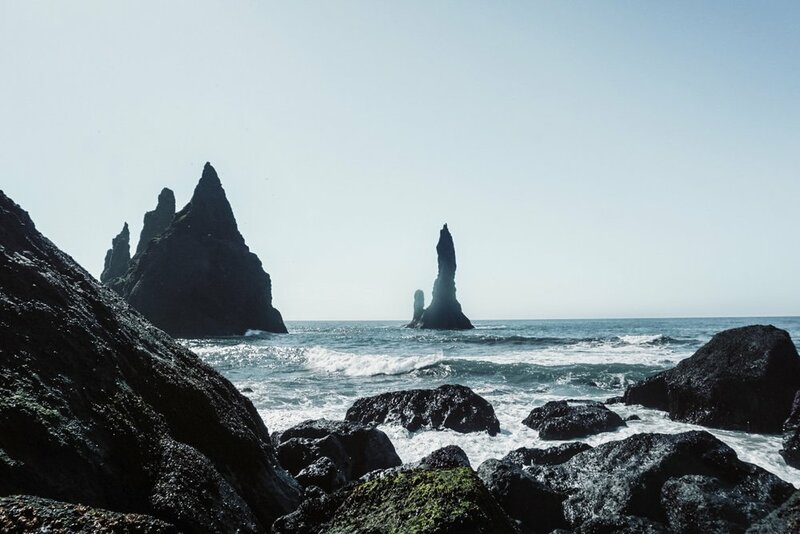 There are many wonderful sights within Vik and it's surrounding areas; keep reading to learn about my three favourites. Reynisfjara is a world famous black-sand beach. I use the term "sand" lightly here; it's actually more like a pebble beach. The sand is made of crushed lava rock that forms when it reaches the cold ocean. Right on the beach there are enormous basalt rocks, roaring Atlantic waves, and stunning views. Everyone is advised to stay clear of the water though; the dangerous rip tides have swept away a few tourists, and are not to be messed with. Vik i Mydral church sits on a hill within the town itself. This little church is incredibly charming and offers views of the entire town. This was just a quick stop for us, but you could sit on the hills by the church and stare out at the ocean before you for as long as you’d like. Icelandic horses are magical creatures. The horses of Iceland are the original Viking horses and are the purist horse breads in the world. The breed has been isolated on the rugged island in the North-Atlantic since the settlement, or over 1000 years ago, without any genetic input from other breeds. My cousins grew up around horses, and so when we drove past a herd while leaving our cabin in Vik, they couldn't resist pulling over to get some pictures. We watched them roam and play with each other for a while, and then continued on our journey to the next destination.